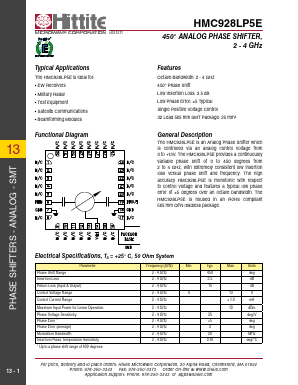 the hMC928LP5e is an analog Phase shifter which is controlled via an analog control voltage from 0 to +13V. the hMC928LP5e provides a continuously variable phase shift of 0 to 450 degrees from 2 to 4 Ghz, with extremely consistent low insertion loss versus phase shift and frequency. the high accuracy hMC928LP5e is monotonic with respect to control voltage and features a typical low phase error of ±5 degrees over an octave bandwidth. the hMC928LP5e is housed in an rohs compliant 5x5 mm QfN leadless package. SE-450 450W Single Output Power Supply View Mean Well Enterprises Co., Ltd.
SE-450_15 450W Single Output Power Supply View Mean Well Enterprises Co., Ltd.